A cyclist suffered personal injury after being hit by a truck in New York yesterday morning. The accident occurred around 11:30 am at the intersection of West 30th Street and Seventh Ave.
A woman riding a Citi Bike and a dump truck were both waiting at the red light on 30th Street. When the light turned green, the bicyclist headed straight ahead while the truck made a right turn and hit her. The woman started to scream and the driver immediately stopped his truck. According to witnesses both the biker and the truck driver started to scream at each other. The woman was screaming “you hit me , you hit me” and the driver was screaming back at her “you were in my blind spot, you came out of nowhere! People at a nearby pizzeria ran out of the store and pulled the victim from under the truck. Her leg was badly mangled. An emergency crew arrived a little after and took her to Bellevue Hospital to be treated. She suffered serious injury to her leg but her life was not endangered. The truck driver stayed at the scene of the accident. He wasn’t charged. 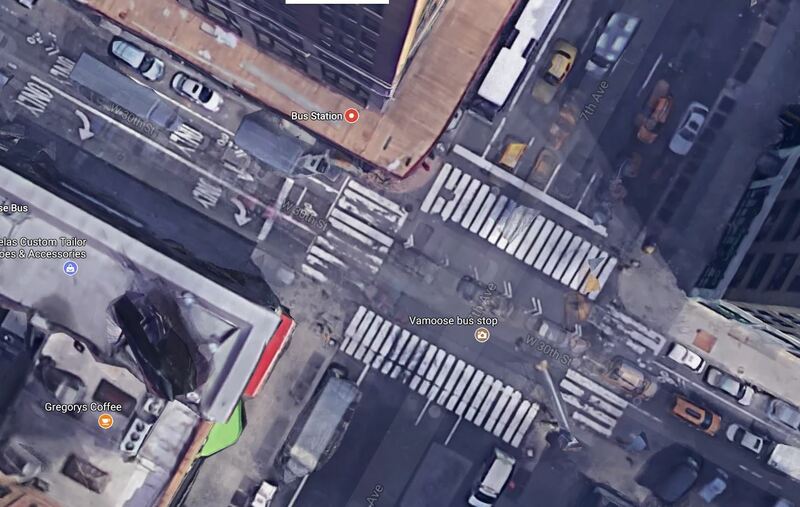 The intersection at 30th Street and Seventh Ave is dangerous and was the scene of many previous accidents. According to the Vision Zero map, in 2009 3 pedestrians, 1 cyclist and 2 motorists were injured in crashes at this intersection. In 2010, 2 motorists and 1 cyclist suffered injury. In 2011, 2 pedestrians, 1 cyclist and 8 motorists were injured. In 2012, 1 motorist, 1 cyclist and 5 pedestrians were hurt in collisions at this location. In 2013, 2 pedestrians, 2 cyclists and 1 motorist were injured. In 2014 another motorist as well as 3 cyclists were injured in accidents at this intersection. In 2015, again 3 cyclists and a motorist were injured in crashes at the same location. Last year again 3 other cyclists, one pedestrian and one motorist were injured in crashes at this intersection. This year so far, before yesterday’s accident, one motorist suffered injury after an accident at this location. Also this year a bicyclist died in a crash just a block away at the intersection of West 29th Street and 7th Avenue. In 2014 a pedestrian died in a crash on West 31st and 7th Ave.